Will More US Troops Really Help in Afghanistan? 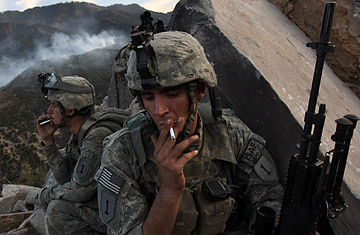 Many U.S. military officers believe the war in Afghanistan was needlessly interrupted by that unpleasantness in Iraq that has cost more than 4,000 Americans their lives. And now that Iraq seems to be settling down, commanders on the ground in Afghanistan are calling for the reinforcements they say are needed if they are to prevail in the stubborn fight now underway there. The steady climb in the number of U.S. troops deployed in Afghanistan shows just how neglected the war has been  and how security conditions there have deteriorated. There were barely 20,000 U.S. troops in Afghanistan two years ago, but today there are 32,000, the most since the Afghan war began. As Taliban and al-Qaeda fighters increasingly infiltrated eastern Afghanistan from sanctuaries across the border in Pakistan, U.S. commanders months ago asked for 10,000 more troops. In recent weeks, the reinforcement request climbed to 15,000 and now stands at about 20,000, Pentagon officials say. While both presidential candidates and top Pentagon officials support the call for more troops in Afghanistan, there is no guarantee that a 20,000 increase will be approved. The U.S. military is stretched so thin  there are still 150,000 troops in Iraq  that it simply may not have the reinforcements available anytime soon. "Unfortunately, we don't have them all sitting at the ready," Pentagon spokesman Geoff Morrell said Wednesday. "We have competing demands for our forces around the world." Some defense officials fear that increasing the number of Western troops in Afghanistan  besides the 32,000 Americans, there are currently about 23,000 troops from NATO allies  may not turn the tide against the Taliban, and may in fact turn more Afghans against the Western-backed government. The reinforcements requested are weighted toward various support forces needed to transport and build outposts for fighting soldiers, given Afghanistan's rugged terrain and poor infrastructure. "There's much more challenging terrain in Afghanistan, and the ethnic tribal mix is much more complex there than in the very complex mix in Iraq," Admiral Mike Mullen, chairman of the Joint Chiefs of Staff, told TIME. "Afghanistan is just a very, very poor country, and not developed; it wouldn't be fair to say it's underdeveloped  it's not developed." Military experts say more must be done if the U.S. and its allies are to prevail. Yet not all of what needs to be done requires force. There is a growing recognition in Washington that the Kabul government backed by the U.S. and its allies needs to negotiate with more moderate elements of the Taliban insurgency. But now, with the Taliban on the offensive, is not the time for such talks. First, the U.S. and its allies need to regain momentum, and for that, more troops are needed. "We need a lot more boots on the ground in Afghanistan, and we need them now," says John Nagl, a retired Army officer who is widely viewed as one of the leading experts on counterinsurgency warfare. "It's a rural insurgency rather than an urban insurgency, so the population's not clustered but spread out very widely, so the demand for troops is large." Nagl says beefing up the Afghan military beyond the 130,000 troops already contemplated is necessary, and a relative bargain. "You can get about 70 Afghan soldiers trained, paid and equipped for about what it costs for one U.S. soldier for a year," says Nagl, co-author of Learning to Eat Soup with a Knife: Counterinsurgency Lessons from Malaya and Vietnam. One of Nagl's colleagues at the nonprofit Center for a New American Security in Washington says the dearth of troops is only one problem facing the Afghanistan mission, and it may not even be the major one. "We do not have a strategic plan for Afghanistan," says Nathaniel Fick, a former Marine officer who served in both Afghanistan and Iraq. He says the U.S. has no Afghan war plan against which to plot objectives and chart corresponding troop needs. "We have an enormous amount of schizophrenia in our policy right now." Fick said he witnessed a less-than can-do attitude among U.S. forces when he spent three weeks as a civilian instructor at the Afghanistan Counter-insurgency Academy in Kabul in 2007 for three weeks. "When I showed up, there was an Army National Guard colonel commanding the academy. When you have the guard commanding a mission like that, it means we don't think it's very important," Fick said, voicing what many active-duty officers think but rarely express. "When I showed up, he was reading the investment book Start Late, Finish Rich. And when I left at the end of the course, he was still reading the book, and we did not have, in that entire time, a really substantive conversation about counterinsurgency." More troops, Fick suggests, isn't going to fix that problem.